Hillary Clinton was careless when she used a personal email server during her tenure in the State Department — but there is no evidence she committed a crime, the FBI chief announced Tuesday. The FBI "did not find clear evidence that Secretary Clinton or her colleagues intended to violate laws governing the handling of classified information," James Comey said. But "there is evidence that they were extremely careless in their handling of very sensitive, highly classified information." "Although there is evidence of potential violations of the statutes regarding the handling of classified information, our judgment is that no reasonable prosecutor would bring such a case," Comey said. Comey said they also found "no evidence that any of the additional work-related e-mails were intentionally deleted in an effort to conceal them." "We also assess that Secretary Clinton’s use of a personal e-mail domain was both known by a large number of people and readily apparent," he said. Clinton used several different servers and numerous mobile devices, he said, adding that the FBI sifted through some 30,000 emails she had provided to the State Department. 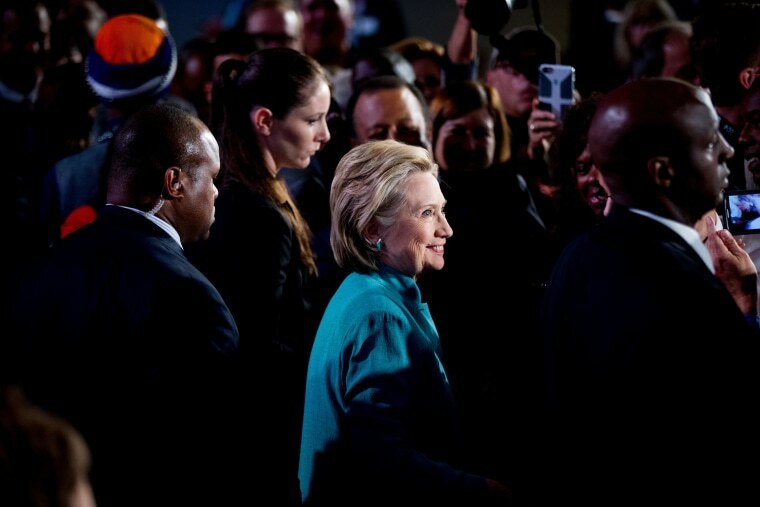 110 emails sent or received on Clinton's server contained classified information. Eight of those were top secret, the highest level of classification. It's possible that "hostile actors" gained access to Clinton's personal email account. "She also used her personal e-mail extensively while outside the United States, including sending and receiving work-related e-mails in the territory of sophisticated adversaries," Comey said. There was “no intentionality” on Clinton’s part to violate any laws. Attorney General Loretta Lynch has already said she would abide by the FBI’s recommendation and by the advice of career DOJ prosecutors. Clinton was addressing a National Education Association summit in Washington, D.C., while Comey was making his announcement. She made no mention of the FBI probe. But Clinton campaign spokesman Brian Fallon weighed in with a statement. "We are pleased that the career officials handling this case have determined that no further action by the Department is appropriate," he said. "As the Secretary has long said, it was a mistake to use her personal email and she would not do it again. We are glad that this matter is now resolved." Fallon's statement did not address Clinton's long-held assertion, now refuted by the FBI, that she never sent or received emails marked classified at the time on her private account. Clinton was questioned for over three hours Saturday by FBI agents investigating whether she mishandled classified information submitted on server. "I've been eager to do it and I was pleased to have the opportunity to assist the department in bringing its review to a conclusion," Clinton told NBC News' Chuck Todd after the interview. Clinton critics have called for an independent investigation into the emails, arguing the Justice Department may not be impartial. They pointed to a recent airport meeting between Lynch and former President Bill Clinton as further proof that the DOJ is biased. House Speaker Paul Ryan, a Wisconsin Republican, said the FBI's decision not to recommend charges against Clinton "defies explanation." "Based upon the director's own statement, it appears damage is being done to the rule of law," Ryan said in a statement. "Declining to prosecute Secretary Clinton for recklessly mishandling and transmitting national security information will set a terrible precedent. " The White House got no advance warning that the FBI had wrapped-up its investigation and had no official comment. But Sen. Tim Kaine, a Virginia Democrat and reportedly one of Clinton's candidates for running mate, said he was "not surprised" by Comey's decision. "I have long believed that this was not going to be anymore than what Secretary Clinton said,” Kaine told Politico. "I never believed this was going to be something in the criminal realm or even close to it." Comey, a Republican, insisted that politics played no consideration in the investigation and said he "couldn't be prouder" of the work done by the FBI. "What I can assure the American people is that this investigation was done competently, honestly, and independently," he said. "I know there were many opinions expressed by people who were not part of the investigation — including people in government — but none of that mattered to us."